Are you a deli roll lover? You know deli roll – the beloved Jewish American dish where various deli meats and Russian dressing get all wrapped up inside puff pastry for a guilt-inducing Shabbat lunch dish. It’s almost like a deli sandwich–knish hybrid. I never grew up eating deli roll, but when I tried it at a friend’s house many years ago, I simultaneously thought: this is so unhealthy and yet I just want more. And so it was just a matter of time before I worked on my own version. This pastrami strudel braid is just a tad fancier than your average deli roll, with the sides cut and folded up to create a braid-like top. I brushed the top with egg wash and sprinkled on some caraway seeds, but you could also add sesame seeds or poppy seeds (or nothing at all) if caraway isn’t your thing. Watch our live Facebook video below to see the step by step. Full recipe is below! In a small bowl mix together mayonnaise, ketchup, relish worcestershire sauce and hot sauce. Add mustard if desired. Remove each sheet of puff pastry and place on work surface. Make slits in the bottom and the top. (see video). Spread thin layer of sauce on bottom. Top with 1/4 lb of pastrami. Add 1/3 cup sauerkraut. Repeat with other piece of puff pastry. 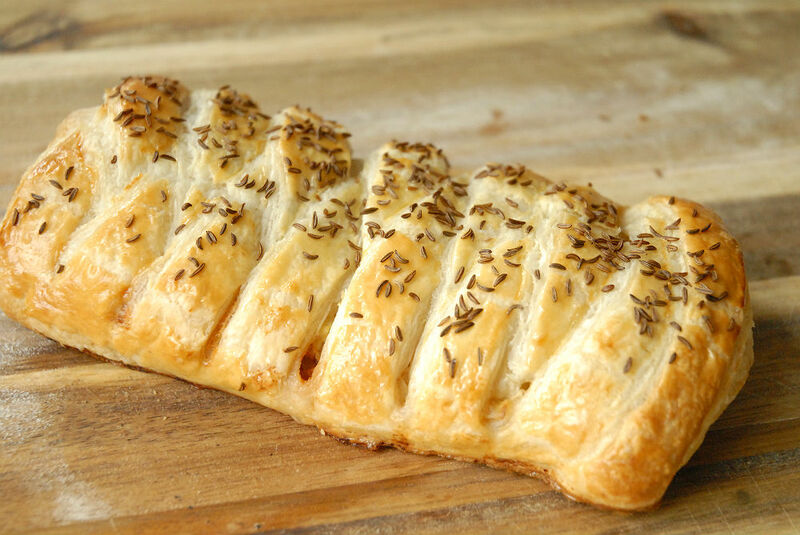 Brush each strudel braid with egg wash. Top with caraway seeds if desired. Bake for 24-27 minutes, until golden on top. Allow to cool. Can be reheated when ready to serve. Yields 2 pastrami strudel braids.